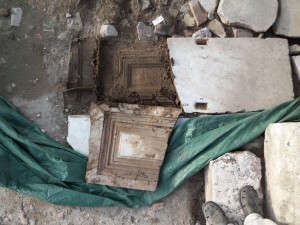 The antique surfaces of the Forum and the adjoining buildings have been cleaned and documented since 2010 thanks to the permits of the Soprintendenza Speciale per i Beni Archeologici di Roma. In 2010 we started with the southeast corner of the forum (MFP) and continued our surface-excavation works counterclockwise around the Capitolium (CAP) to the northwest portico (MFW). 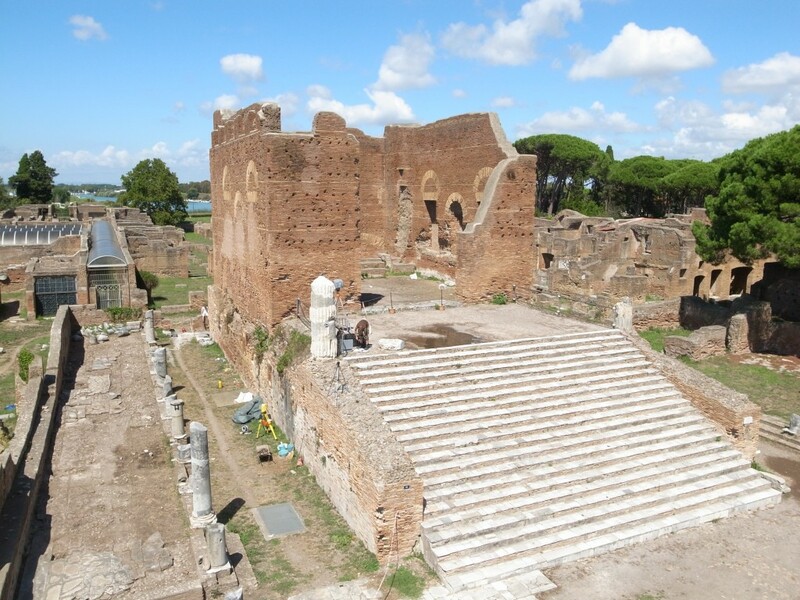 Until the end of the campaign in september 2013 we finished with the southwest corner of the Forum (MFD). The ancient surfaces of the Forum porticoes were documented with the highest standard of available technical equipment (compare section “Aims and Methodology“). We have found different layers of occupation above the latest pavement, several areas of well-preserved and previously unknown pavement slabs and big areas of mortar bedding beneath. The mortar areas were of specific interest, because on one hand the different mortar qualities allowed us to differentiate several building- and repair-phases of the Forum’s pavement, and on the other hand because coins and ceramic finds embedded in this mortar allowed us to date the building activities. Our main excavation and survey activities focused on the pavements. Standing walls and monuments, partly preserved up to a height of 3 m around the Capitolium with its exceptional height of approximately 17 m (see picture above), were documented in separate subprojects (see section “Subprojects“, e.g. “The MFP Apse: Documentation and Building history“). The status quo of the pavements excavated so far, is a product of centuries of robbing activities and erosions by wheather and mass-tourism until today. However, the remaining areas of pavement and mortar bedding contain a huge variety of traces of the ancient everyday life in the centre of a city for more than 500 years. In august 2010, the Berlin team started the surface cleaning of the biggest portico of the Forum situated in the southeast and attached to the Caseggiato dei Triclini (CDT). The archaeological surface cleaning proceeded from south to north and covered 20 grids, each measuring 5 by 5 m (see pictures below). The portico was excavated in January 1924 in less than one week. The results of this hasty removal of archaeological material were on one hand the loss of almost all stratigraphical evidence above the latest pavement level, and on the other hand the omission of deeper excavation activity. In 2010, it was a big surprise for us to discover previously unknown areas of pavement in the already excavated Forum’s portico (see picture above). These areas covered almost the whole surface of 5 grids (see section “MFP“). 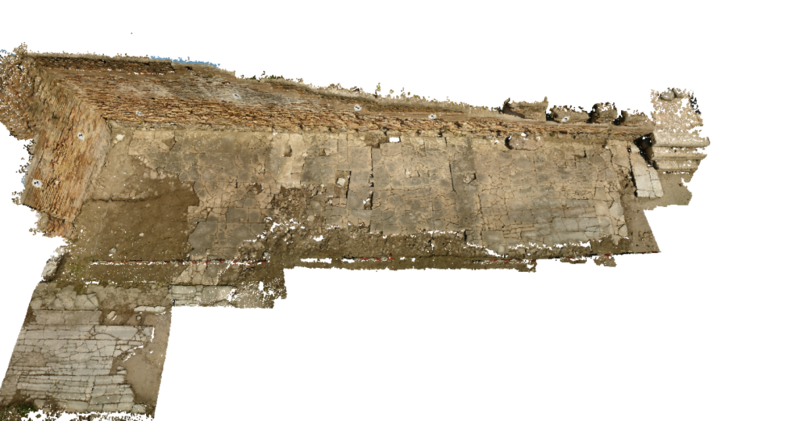 During the 2010 campaign, the south part of the portico, including the apse, was excavated to the level of the mortar and pavement, and documented through laserscans, horizontal-photography, and 3-D-ortho-photography. After the 3-dimensional measurements of the elevation and position of all individual slabs, the slabs were turned around in a systematic manner. 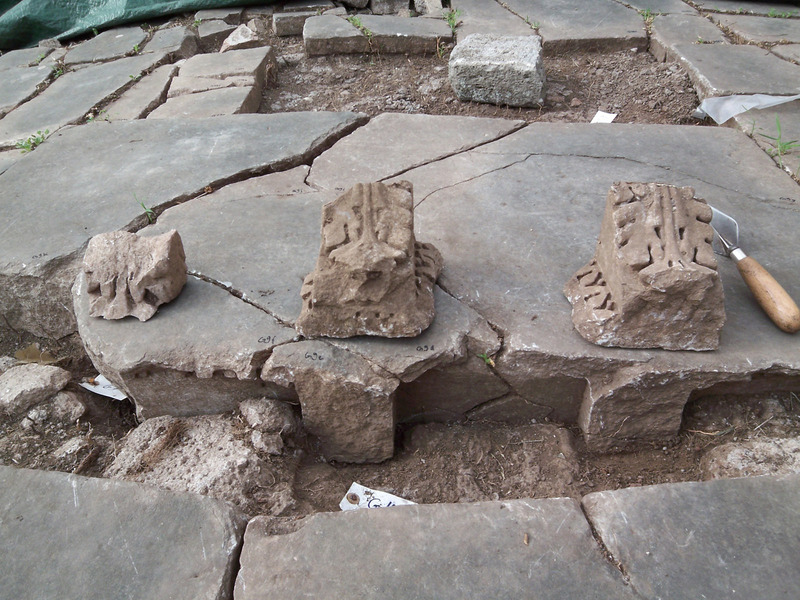 We found high amounts of reused slabs with architectural decoration and many fragments from one large inscription. This high-value find ensured our working hypothesis that this pavement level was not touched by the excavators of the 1920’s. The earliest visible phase, MFP 1, is dated to the late 1st and 2nd centuries. A fundament of a wall that bisects the portico in a north-south direction has been dated to the beginning of this phase (see the pictures of m1 at “MFP”). On top of this fundament, several brick piers have been preserved, and are cut to the level of the pavement. Fundament m1 divides MFP into a portico (closest to the wall) and a street running parallel to the west. In phase MFP 2, the portico was extended, and the pavement was twice the size as the first portico. In this phase, MFP 2, the pavement was expanded with slabs of Proconnesian marble with a thickness of 6 cm, thus covering and incorporating the street into the portico. The position of the piers of m1 were covered with slabs. Coins dating to the period of Constantine provide a terminus post quem for the final phase of today’s visible slabs in phase MFP 2. 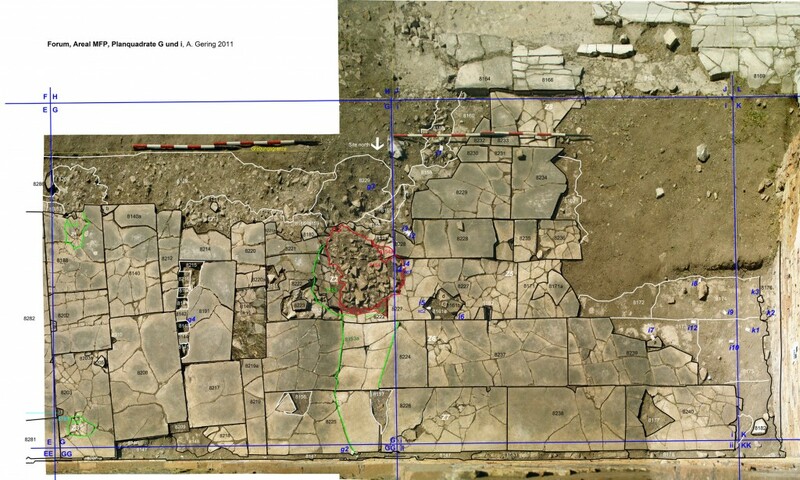 The stratum of filling for the rest of the street contained debris from the hadrianic piers and walls that were ruined by an earthquake during the late 4th or the first half of the 5th century (Gering 2011, 465-467). In phase MFP 3, architectural spolia comprise both the filling, but also the pavement (see picture below). This phase has a terminus post quem in the second half of the 4th and the beginning of the 5th centuries (considering coins of Arcadius and Honorius were excavated), thus corresponding to phase 2 of FSE. 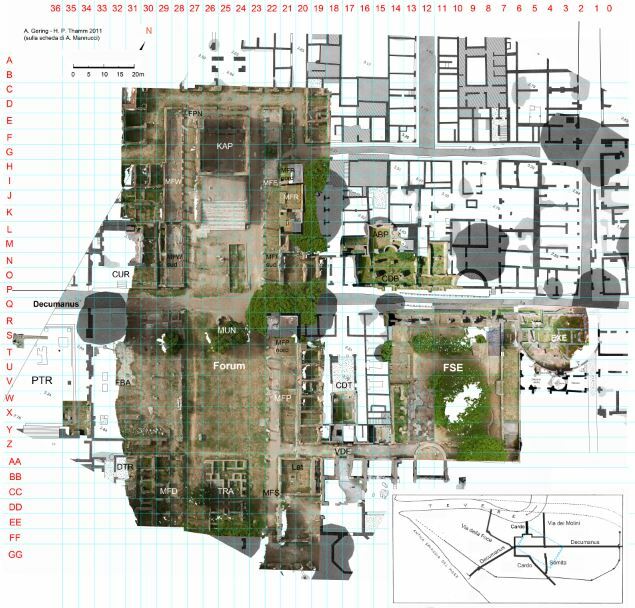 The different areas of renovation in MFP 3 make it difficult to identify if just one catastrophe, or several, prompted the renovations. Gering has divided phase 3 into three sub phases – a, b, and c. MFP 3a comprises pavement with a terminus post quem (TPQ) in the second half of the 4th century (Valens), and MFP 3b comprise repairs of the pavement with a TPQ after the reign of Arcadius (395-408) and Honorius (395-423). Due to the long period of money circulation, this building-phase can be dated only by a closer look to the ceramics imbedded in the mortar. The late antique pavement is characterized by spolia that are reworked and cut to fit the secondary context. Furthermore, the pavements of MFP 3b and c is irregularly laid, as seen at FSE (Gering 2011, 467-470). After the middle of the 5th century, we can attest a new typology of repairs and changes of function within the portico. The latest coins and ceramic finds suggest that the phase MFP 4 and 5 show limited repairs of the later 5th and early 6th centuries. This section will be updated soon regarding all other areas of the Forum and the campaigns 2011-2013!